On 24/Jan/43, the only two survivors of U-164, after an ordeal of 21 days adrift in the ocean, washed out in the desert coast of the State of Maranhão. Rescued by local fishermen of a small town, they were given the best available emergency medical assistance. Soon after they recovered from hypothermia and malnutrition they were handed over to the Mayor which proudly treated them as a legitimate Prize of War. When Brazilian Naval authorities were aware of the issue, a group of officers dashed to the scene. Once confronted by the men in uniform, the Mayor flatly refused to surrender the bewildered Germans until threatened by the “mailed fist”. They finally boarded a US Navy PBY-5 and set for Natal for interrogations before facing a long internment in one US POW Camp. Pictures kindly sent by Cap. Jerry Mason USN Ret. The young Billie Goodell being decorated by Adm. Jonas Ingram. Copy of the Presidential Unit Citation received by Patrol Squadron 83. Brief report made by Billie Goodell on the sinking. In the picture oil slick can be seen as well as the life raft the PBY dropped to rescue the survivors. By this time U-164 has disappeared from surface leaving only the large oil patch. U-164 in her final moments. 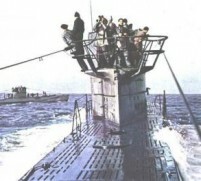 The sub was attacked by all sides leaving no option for her doomed crew. Several men were seen on the surface, but only two managed to made ashore.